Let’s discover this Sunday a beautiful region and the fantastic regional food coming from the Aosta Valley: this is an hearty, creative and composed cousine made of authentic flavors. The typical products of Aosta Valley (Valle d’Aosta) tell about , the story of an Alpine region and its identity through its lovely taste. A tale of unique flavours, unique to a particular geographical location, where the quality of raw materials and production techniques are as old as refined. 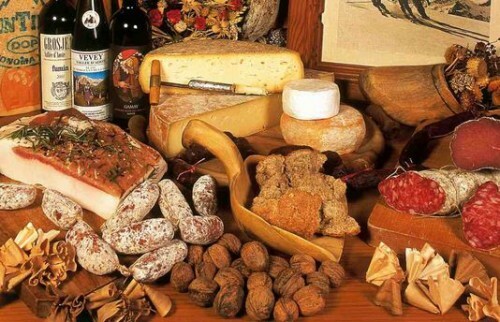 Do not miss among the many specialties of Valle d’Aosta, are those that have been awarded the “Protected Designation of Origin” such as the Fontina cheese, Valle d’Aosta Fromadzo, Jambon de Bosses and the Vallée d’Aoste Lard d’Arnad that can be enjoyed in conjunction with the best DOC wines of Valle d’Aosta. Some regional specialties to be found and try are carbonade, (meaning stewed meat with wine, onions and spices), and mocetta (meaning dried beef or ibex seasoned with mountain herbs). The carbonade for four people uses up to g. 800 of beef, only gr. 50 of butter, onion, red wine and liqueurs, white flour, salt and pepper to taste. After cutting the meat into pieces, pass it in flour and fry in butter that you have melted but not burned. Remove the meat placing it in a pot and fry very well, in the same butter, onion cut into small pieces; put the meat in the pan and cook for a long basting occasionally with wine Rosss. When cooked, add salt with a certain generosity (the original recipe called for the use of the meat in salt) and pepper to dose. Serve with alcoholic wines with good structure as Donnas, Fumin, Arnad–Montjovet or Higher with Sassella or Chianti Classico. For the ones who likes salami, you are in the right Italian region! Salami is another delicacy to taste. On the some note, do not be miss is the gorgeous Arnad lard, a type of Aosta Valley sausage cooked with boiled potatoes, lard, seasoning, and the well-known Bosses ham. What about the cheeses? They are an equally-excellent choice, including the reputed Fontina Dop, which is used for many recipes like the fondue. The dish is made with fontina cheese combined with milk, butter and egg yolks. This nutritious dish is served with cubes of toasted bread, polenta, rice. Serve with Aosta Valley Rosé and red, Premetta, towers or Chambave Red. The fondue is served before or after the great related soup of the Aosta Valley (made with cabbage, Savoy cabbage, fontina cheese and stale rye bread). The soups to be typically linked to wines such as Valle d’Aosta Morgex Blanc de La Salle, Petit Arvine, Gamay. As regard to the other soups, you can’t go away from Aosta without tasting the Seupa de grì, an ancient soup “valligiana” (from the valley) made from barley long cooked with pork ribs and vegetables. It can be consumed even after two or three days after preparation, so the whole becomes even more flavoured in itself as it is already vigorous. The Soupe valpellinentze is named after the Valpelline. This dish consists of potatoes, boiled cabbage, fontina cheese and meat broth, all passed in the oven. The Soupe Paysanne is a lovely soup of stale rye bread cut into slices or chunks, cubes of fontina cheese and toma cheese, butter, onion and herbs, all covered with hot broth and baked in the oven. For the Camoscio-Capriolo alla valdostana, you typically use the thigh or filletof the suede or the deer, soaked in red wine with natural flavours, then browned in a pan and sprinkled with brandy. They are served with polenta slices fresh or roasted on the grill. Also the Costoletta alla valdostana (Chop from Valle d’Aosta) is something to try. This popular meat course is prepared by opening a veal cutlet stuffed with ham and fontina cheese, then breaded and fried in plenty of butter. ready for your dessert? Here it comes the Blanc Manger, a typical dessert of Savoy, made with cream, sugar and vanilla. Tegole di Aosta (Tiles of Aosta) are tablets made of almond paste, sometimes coated with chocolate. The Brochat, is a sweet achieved by thickening milk, wine and sugar over low heat. The mixture it can be spread on black bread, while the Fiandolein is instead zabaglione with milk, sugar, rum and a hint of lemon. To finish off, have a go with the coffee of Aosta Valley: Essential end of each lunch Valle d’Aosta, you will add sugar, a generous dose of brandy and lemon zest, and after flamed in a wooden cup low and rounded to more nozzles (the so-called friendship cup), as you are going to be drinking it with friends. More than 20 wines are designated as originating from “Aosta Valley – Vallée d’Aoste.” Some examples are Arnad Montjovet, Enfer d’Arvier, Blanc de Morgex et de la Salle and Donnas. Complete your meal with the extraordinary herb liqueur “Genépy des Alpes,” traditionally drunk from a wooden goblet. Thanks to the region’s microclimate, vines can bear fruit up to 3,937 feet in altitude, while the fruit trees bear also walnuts, chestnuts, Rennet apples and the famous Martin pears. I am very hungry and you?